The University of Ulster’s School of the Built Environment has been recognised by a leading UK professional body for its excellence in the teaching of energy and building services engineering. It has won the Happold Brilliant Award 2010/11, a prestigious accolade given out each year by The Chartered Institution of Building Services Engineers (CIBSE). The award also recognises the broad range of courses the School has to offer including BEng (Hons) and MEng in Energy and Building Services Engineering and MSc in Renewable Energy and Energy Management. Dr Philip Griffiths, Associate Head of the University’s School of the Built Environment, said the recognition demonstrated the University’s commitment to providing the best possible teaching expertise and broadest range of courses. “We are confident this will enable our students to achieve their maximum potential and, if required, full professional qualifications,” he said. “All the courses in the School of the Built Environment are fully accredited with their respective professional bodies, aligning their learning outcomes with both national teaching quality and professional standards. “The core teaching for the energy courses is drawn from the Centre for Sustainable Technologies and across the School. There is an emphasis on quality of design and a high level of sustainability from the outset. “The Energy and Building Services course and the MSc are research informed throughout, tackling issues of energy supply, energy efficiency, internal environment conditioning, impact on the environment and use of resources. 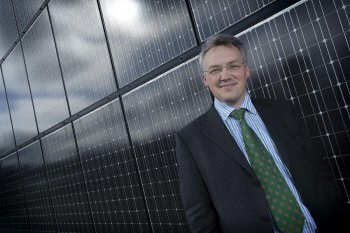 “Research on developing new glazing systems, novel solar energy systems, heat pump heating, energy storage and power generation is fed into the course as students are exposed to new thinking and techniques. “This research is recognised internationally through research partnerships with industrial and academia across Europe and further afield. Dr Griffiths spoke of how the School of the Built Environment had put sustainability at the heart of its courses. “The challenges that face the profession are considerable. For example, we need to deliver buildings and an urban environment in a world where competition is increasing for resources,” he explained. CIBSE Qualifications Officer, Rosemary Perks, said: “CIBSE are delighted to award the Happold Brilliant Award 2010/11 to the University of Ulster’s School of the Built Environment for its teaching excellence and the broad range of courses it offers. The Happold Brilliant Award will be presented to the University of Ulster at the CIBSE President’s Awards Dinner, which will be held at the Renaissance Hotel in London on Friday October 7.